The first page of an excerpt from a letter to the Editor of the Aberdeen Chronicle. 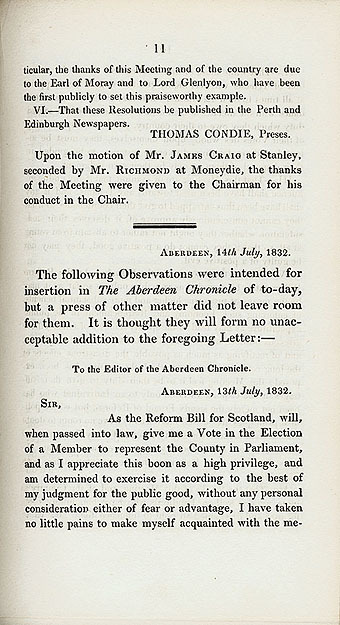 The writer is concerned about the bias of the Tory produced pamphlet, 'Remarks on the Principles of the opposing Candidates for the Representation of Aberdeenshire'. The two candidates for the 1832 election in Aberdeenshire were Sir Michael Bruce, ( for the Whigs), and Captain Gordon, (Tory). The writer supports Bruce. The letter also mentions the Whig stand on the proposed Repeal of the Corn Laws. The Whigs planned to allow free trade in corn. The Tories were worried that this would leave the British farmer unprotected against low prices and allow the market to be flooded with cheap foreign corn.